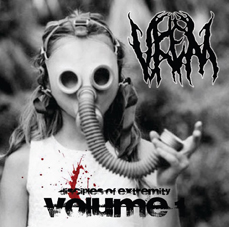 The label is called UKEM RECORDS (united kingdom extreme metal). UKEM began life as a facebook page which i started as a way of promoting extreme metal bands from the UK to be used as a meeting point for anyone into or involved in the uk extreme metal scene. This page soon gained a massive following (or likes on FB). Because the interest was so great in the group i had started i decided to start a blog for UKEM, reviewing bands releases, doing interviews and having special features. This, as with the facebook page, was a great success after such a little time and the blog now attracts around 3000 hits a month. Several people had messaged me asking me "when are you going to start a label, its seems like the natural thing to do surely". And after much thinking and consideration i decided these people were right, it as the next logical step, so in November 2011 UKEM Records was created! We have three releases so far, which in itself is quite impressive for such a young label. I dont consider one release to be more important than another, every release is important and every release is unique. Our first release was a 19 band compilation entitled "DISCIPLES OF EXTREMITY Vol1" and was very well received by the underground. We pressed limited number but it sold out almost straight away and the reviews to date have been great! Next up was an ambitious project, LACERATION - TORTURED INAUGURATION limited edition digi-pack release. There was alot of hard work put into this release, having never produced a digi-pack before it was a very big learning process, but the end product is great and features some precisely played death/grind.This again has sold out, although i secured distrubution with several labels and distros which should still have copies. Our third release is another compilation, entitled "DISCIPLES OF BLASPHEMY" its features 13 UKBM bands and is a step up from the previous compilation, not only is the quality of the tracks but also the design and presentation. This is due out in March 2012 and pre-orders have been great, ths release is almost sold out at the time of writing this interview. Really pleased with the reactions to all of our releases so far, long may this continue! I'm not currently accepting any promos for consideration to the label. I have apporached all the bands the label have been involved with so far after hearing their material. Each of these bands sent cd's to me for review on the UKEM Blog and that's how they came to my attention and how each of them has ultimately ended up on the UKEM Records roster. Probably my love of UK extreme metal and a passion for promoting it not only in the UK,but worldwide. I make sure i'm always communicating with the bands on the label, keeping them upto date with anything and everything as each release is a joint effort between band and label. We offer undergorund bands the chance to have their music released in a professional format via the label, limited edition releases in small quantites but backing it up with maximum promotion and gething the release to a wider audience outside the uk through a network of other underground labels and distros. Our next release is from SACRILEGIOUS THRONE ns will feature the bands e.p with bonus material being some brand new tracks. A release for fans of DIMMU BORGIR / WATAIN. We then have an e.p planned for melodic death metal outfit CRYOSTORM, a split black metal release featuring ULFARR and HELVELLYN. We will also be re-releasing an e.p from THE OBSCENE (The torment of sinners, originally released on PEST RECORDS) and we also plan to distribute their full length album ARCHITECTS OF DELIVERANCE. Hopefully the second cd in the DISCIPLES OF EXTREMITY compilations will see the light of day this year, so its going to be a very busy year indeed! The future will hopefully be a good one, the support from bands and extreme metal fans has been unbelievable. I think people "get" what i'm trying to achieve and have given me their full backing and i cant thank everyone enough for this, it really does mean so much to have such support! We have a brand new website up and running now, still some develpoment to do, but we're just about there! visit www.ukemrecords.co.uk the store is there as are all the links to the various UKEM pages. Many thanks for this interview, support like this is also really apreciated....ALL HAIL UK EXTREME METAL!! !